Though research at the intersection of AI and sustainability has been going on for many years, with papers such as Todorovski, et al  and Phillips, et al  being some of the more recent examples in this long history, growth in the area accelerated coincident with the founding of the International Conferences on Computational Sustainability. The inaugural conference, CompSust09 (http://www.computational-sustainability.org/compsust09), highlighted the relevance of AI to problems concerning sustainability, with areas of machine learning and optimization taking center stage, and computer vision receiving substantive attention too. Of sustainability areas, particular attention was given to the natural environment, including biodiversity, natural resource protection, and Earth system monitoring. In CompSust10 (http://www.computational-sustainability.org/compsust10), the topics addressed opened up considerably, and included energy-efficient computer architectures and algorithms; social computing, crowdsourcing, and collective intelligence; as well as other areas of AI, such as computational game theory. Sustainability areas beyond those directly concerned with the natural environment also strongly emerged, most notably energy, smart grids, electricity markets, transportation, and materials. These new themes had been presaged in earlier work, such as white papers of the CRA/CCC (http://www.cra.org/ccc/whitepapers.php). While there was no CompSust conference in 2011, chairs of the earlier conferences, Carla Gomes and Brian Williams, launched a special track at the Twenty-Fifth Conference on Artificial Intelligence (AAAI-2011) on Computational Sustainability and AI, which has carried over to AAAI-2012 as well. This was a significant development, because it incorporated sustainability into a flagship conference of AI. In fact, a paper in the special track  received one of the conference�s two outstanding paper awards. Because this IEEE IS issue is temporally coincident with the AAAI-2012 and the Third International Conference on Computational Sustainability (http://www.computational-sustainability.org/compsust12/), it seems fitting to survey the papers in the earlier 2011 conference. Importantly, these papers reflect a representative sample of the research underway, with attention to sustainability aspects of built, social, and natural environments; using AI strategies for learning, planning and scheduling, and optimization generally. An overview also invites synthesis, with AI concepts and methods being a framework for reasoning about sustainability challenges. Figure 1: Papers of the AAAI-2011 special track on Computational Sustainability are organized vertically by a main AI thrust and horizontally by a main sustainability theme. Each paper is indicated by an abbreviated title, and by the number of the paper as it is listed in the References section. The figure is intended to give a quick, global picture of the papers, recognizing that a 2D representation oversimplifies. Several papers in AAAI-11 advanced optimization methodologies for purposes of resource management. Lai, et al  addresses the problem of designing corridors that link up existing protected reserves of land, typically so that an endangered species can mix genetically within the protected, contiguous region. The paper observes that corridor design can be framed as a Steiner tree problem of connecting two or more specified nodes in a graph (i.e., the existing reserves) by a least-cost network of nodes (i.e., land parcels), where cost might be the purchase price of acquired parcels. In , the problem of building a least-cost corridor that supports multiple species is considered. The authors term this the Steiner Multigraph Problem, and for corridor design it acknowledges that not all land parcels may be suitable to all species (e.g., one species may find a steep mountainside impassable, whereas another may not). There are interesting variants of corridor design. The suitability of land can be generalized, for example, from binary (suitable or unsuitable) to ordinal or continuous, and a highest-utility subgraph (i.e., corridor) that does not violate a fixed budget is desirable . This variant better approximates what a real wildlife manager may be confronted with – not how do I find the least cost solution, but rather, how do I find the highest utility solution subject to my fixed (monetary) budget? In another AAAI paper, Golovin et al  address the general problem of obtaining parcels of land that maximize utility (i.e., survival probability of one or more species), subject to a budget constraint. While these authors are concerned with the acquisition of reserves, and not corridors linking existing reserves, they address the challenge of dealing with a budget that unfolds piecemeal, each year a new budget that (typically) only partially satisfies a long-term vision. Moreover, land parcel costs and utilities can change, for example, as residential lots encroach on formally isolated habitats. This dynamic resource allocation  problem reflects more closely still what a wildlife manager is confronted with – changing budgets, utilities, and costs. Reserve and corridor design are clearly related and complementary, so it would not be surprising to see dynamic variants on corridor design emerge. Moreover, these efforts have developed relatively efficient algorithms that do a good job of approximating the best solutions possible in their respective tasks. More generally, �probably approximately optimal� algorithms, which find solutions that are sufficiently close to optimal most of the time, are often desirable if they are also computationally cheaper. Often the �efficiently probably approximately� characteristics stem not from formal algorithmic guarantees, but are an empirical manifestation of patterns and constraints found in real-world problem structure . Dynamic planning begs more sophisticated models of changing environments so that planning algorithms can project into the future. In  a focus on modeling interactions between species and environment, for example, informs projections that a species will occupy the parcel or not. Models, if available for corridor design , could be used to estimate the probability a species would stay within a corridor or wander into unprotected regions. Phillips and Elith  and Hutchinson, et al  discuss machine learning for predicting occupancy of parcels by species, and both can be folded into larger scale wildlife and resource modeling and planning systems. 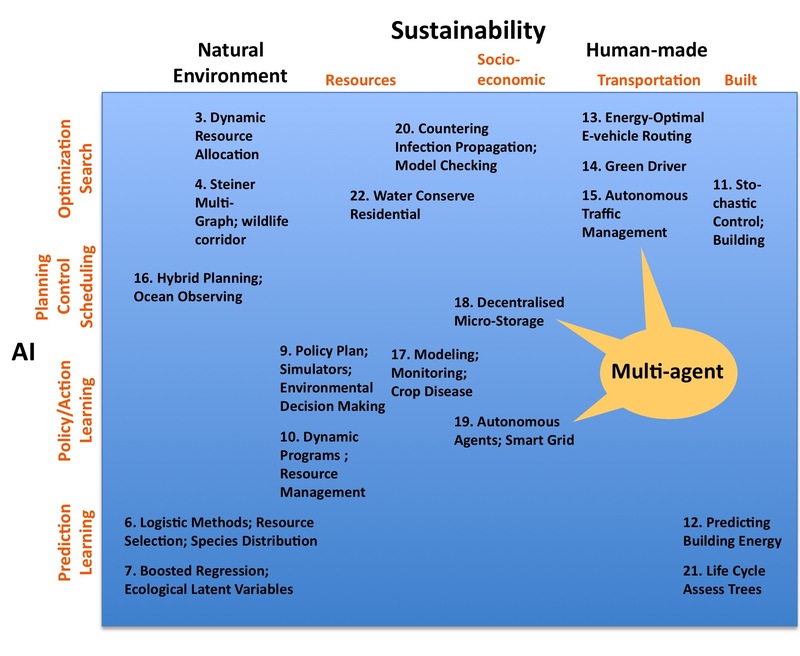 The importance of modeling agents, such as species (to include humans) as a function of context, could be taken further by evaluating designs against full-blown agent-based simulations . In fact, this is essentially the motivation behind Crowley and Poole�s  use of expert-created, high-fidelity simulations of forest dynamics to learn timber harvesting policies that are sustainable over decades. Policy learning strategies are also the focus of Petrik and Zilberstein , who develop novel approaches that are applied to find best policies for water reservoir release (e.g., for generating hydro-power). Though this later project relies on historical data to learn policies, it too could benefit from simulations of river and reservoir dynamics. Policy learning (e.g., where and how much to harvest, when and how much water to release) is suited to these latter projects because human interventions are intended to be transitory (e.g., forests regenerate and reservoirs refill), and indeed the intervention is part of a sustainable cycle. In contrast, reserve and corridor design are intended as interventions that are more or less permanent. A number of papers were concerned with applications in human made environments, and we focus here on buildings and transportation. El-Din Mady, et al  describe an HVAC controller to lower energy usage and lower expected occupant discomfort. HVAC actions are informed a Markov model of building occupancy, with random elements modeling uncertainty on adherence to a standard work schedule. There is also impressive modeling of the room environment, including the heat dynamics of walls, water radiators, windows and the like – all of this is required for high-fidelity simulations of changing building conditions. Occupant discomfort is measured as the squared difference between the actual and a referent temperature, weighted by a probability of occupancy. Experimental simulations indicate the promise and limitations of this model-dominant approach. Input from occupant sensors and counting the number of occupants is planned as future work, and indeed the addition of actual observations would be a natural and helpful input to the controller. We might even imagine, with attention to privacy concerns, that computer vision activity recognition could identify individuals and customize conditions to their stated or learned preferences. In contrast to the model-dominant approach, Kolter and Ferreira  evaluate various (regression) approaches that learn from data to predict a building�s total energy usage. The project collated data from GIS databases on building locations and layouts, tax assessor data on building characteristics, and data on monthly electricity and gas usage, then compared the accuracy of various regression methods. With good predictors in hand, a building�s actual energy usage can be compared to predicted usage for buildings of like characteristics – this can be useful information in the hands of a building manager who can then investigate and adjust energy use. Presumably, those buildings doing worse than predicted can benefit from occupant modeling  and/or even greater customized control. Three papers were concerned with transportation, specifically with personal vehicles over short distances by road. Two of the papers are concerned with using AI search methods to find optimal routes, where optimality is defined differently in each case. Sachenbacher et al  are concerned with finding routes for electric vehicles that minimize net energy loss, where some segments (edges) in a route may have negative costs because these segments have properties that serve to recharge the vehicle�s battery. The system relies on a model of energy dynamics in order to estimate route segment costs, and these estimates are made dynamically, based on changing factors such as payload weight and AC usage. Apple, et al  also plan routes to minimize expected time of transit. These routes are based on modeling assumptions, as well as data from smart phones. To assist in this planning, the system models traffic light control, enabling it to compute probability distributions over time spent at lights by a vehicle conditioned on various factors. Another source of uncertainty that is dealt with in  is the location and route taken by a vehicle, given GPS data on vehicle location. Along different lines, Au et al  extend earlier work in multi-agent systems that move smart vehicles through intersections with no reliance on traffic lights. Rather, smart vehicles request passage and are guided through as requests are honored. Simulations show that the new intersection management protocol reduces delays at intersections in the face of unbalanced traffic flows from inlet roads. In future contexts of ample (smart) resources, we might expect the technology of  to reduce uncertainties that are currently modeled in the routing approaches of  and , because the vehicle itself intervenes in the process. Papers of AAAI-12�s computational sustainability track illustrate different commitments to model-based inference and data-supported inference, ranging from model-dominant at one end (e.g., ) to data-dominant at the other (e.g., ). Undoubtedly, as projects move out of simulation and into the physical world, they will increasingly use data. Li and Williams� , who describe planning for an autonomous underwater vehicle (AUV) for purposes of ocean monitoring illustrates data collection through robotic exploration, which could be adapted as part of aquatic reserve design. Quinn, et al  describe another data-collection technology that informs occupancy assessment using camera-enabled mobile devices to identify crop disease. While they are directly concerned with �occupancy� of disease, the technology is promising for purposes of other kinds of occupancy assessment. While data comes with its own stochastic elements, it can also reduce uncertainty for problems such as occupancy detection of various forms. Controlled interventions can further lower uncertainty (or raise it!). Many papers propose interventions into natural and built settings, but also social settings. Though we have not focused on this latter case, two papers explored market strategies for smart grid operations, one for controlling the use of �home� and other micro storage of energy (Voice, et al ) and one exploring implications of different small-scale energy broker strategies on supplier balances and other balances (Reddy and Veloso ). Apropos control, Santhanam, et al , investigates model-checking strategies for evaluating the success of interventions that are intended to stop �infections� on networks, be they social, geographic, physical, or economic. The emphasis on these and the great majority of papers on evaluation with respect to interventions is noteworthy. If anything, investigations need to expand the context in which evaluation occurs, to ferret out what may be otherwise unanticipated consequences of technological interventions by humans. Finally, interventions are often forwarded to make the best out of poorly designed environments. For example, attempts to improve the efficiency of travel by private automobiles that use fossil fuels are a good example – these efforts are important, but we can go further and design systems, ranging from products to communities, to be efficient and to invite efficiency in the manner in which they are used. Many of the papers are overtly design papers (e.g., corridor design). Additionally, there are two papers that focus on more conventional forms of design. Patnaik, et al  induce lifecycle assessment trees for products from �high level� product descriptions. Such trees can be used in the design of products, reasoning about the environmental impacts of component design choices for example, favoring environmentally sound choices. Hoenigman, et al  addresses the design of residential landscapes that require less watering; this is more than using native plants, but is cast as an optimization problem, getting into issues of plant arrangement in ways that heartier plants protect more sun-sensitive plants. While this might be considered a non-traditional design problem, it nicely illustrates how environmental design upfront can mitigate the need for playing environmental catch-up later. This article intended, at a minimum, to give the briefest glimpse of the papers of the 2011 AAAI Computational Sustainability track, so that interested readers could follow-up. Collectively, however, the contributions include representations of much that we might hope to see in an environmentally minded cognitive agent, with competencies in sensing/observation, knowledge-based reasoning, decision-making, and actuation. The creation of such agents could be an exciting and important ambition, with attention paid to agent communication as well. In the near term, however, AI will offer important, albeit specialized cognitive tools for decision makers. It is critical that these tools are adopted, adapted and used by humans. Thus, it is vital that as part of our evaluation methodologies, we move beyond questions concerning technical optimality, and that we work with social, behavioral and economic scientists to understand the social contexts in which our tools are used (or not)! 1. L. Todorovski, et al., �Using equation discovery to revise an Earth ecosystem model of carbon net production,� Ecological Modelling, no. 170, 2003, pp. 141-154. 3. D. Golovin, et al., �Dynamic Resource Allocation in Conservation Planning,� AAAI Conference on Artificial Intelligence, AAAI, 2011, http://www.aaai.org/ocs/index.php/AAAI/AAAI11/paper/view/3617. 4. K. Lai, et al., �The Steiner Multigraph Problem: Wildlife Corridor Design for Multiple Species,� AAAI Conference on Artificial Intelligence, AAAI, 2011, http://www.aaai.org/ocs/index.php/AAAI/AAAI11/paper/view/3768. 5. J. Conrad, et al., �Incorporating Economic and Ecological Information into the Optimal Design of Wildlife Corridors,� Computing and Information Science Technical Reports, http://hdl.handle.net/1813/17053. Cornell University, Ithaca, NY, 2010. 6. S. Phillips and J. Elith, �Logistic Methods for Resource Selection Functions and Presence-Only Species Distribution Models,� AAAI Conference on Artificial Intelligence, AAAI, 2011, http://www.aaai.org/ocs/index.php/AAAI/AAAI11/paper/view/3657. 7. R. Hutchinson, et al., �Incorporating Boosted Regression Trees into Ecological Latent Variable Models,� AAAI Conference on Artificial Intelligence, AAAI, 2011, http://www.aaai.org/ocs/index.php/AAAI/AAAI11/paper/view/3711. 8. E. Bonabeau, �Agent-Based Modeling: Methods and Techniques for Simulating Human Systems� Proc. Nat�l Academy of Sciences, vol. 99, suppl. 3, 2002, pp. 7280–7287; www.pnas.org/content/99/suppl.3/7280.full. 9. M. Crowley and D. Poole, �Policy Gradient Planning for Environmental Decision Making with Existing Simulators,� AAAI Conference on Artificial Intelligence, 2011, http://www.aaai.org/ocs/index.php/AAAI/AAAI11/paper/view/3631. 10. M. Petrik and S. Zilberstein, �Linear Dynamic Programs for Resource Management,� AAAI Conference on Artificial Intelligence, 2011, http://www.aaai.org/ocs/index.php/AAAI/AAAI11/paper/view/3608. 11. A.E. Mady, et al., �Stochastic Model Predictive Controller for the Integration of Building Use and Temperature Regulation,� AAAI Conference on Artificial Intelligence, 2011, http://www.aaai.org/ocs/index.php/AAAI/AAAI11/paper/view/3719. 12. J. Kolter and J. Ferreira, �A Large-Scale Study on Predicting and Contextualizing Building Energy Usage,� AAAI Conference on Artificial Intelligence, 2011, http://www.aaai.org/ocs/index.php/AAAI/AAAI11/paper/view/3759. 13. M. Sachenbacher, et al., �Efficient Energy-Optimal Routing for Electric Vehicles,� AAAI Conference on Artificial Intelligence, 2011, http://www.aaai.org/ocs/index.php/AAAI/AAAI11/paper/view/3735. 14. J. Apple, et al., �Green Driver: AI in a Microcosm,� AAAI Conference on Artificial Intelligence, 2011, http://www.aaai.org/ocs/index.php/AAAI/AAAI11/paper/view/3648. 15. T. Au, et al., �Enforcing Liveness in Autonomous Traffic Management,� AAAI Conference on Artificial Intelligence, 2011, http://www.aaai.org/ocs/index.php/AAAI/AAAI11/paper/view/3762. 16. H. Li and B. Williams, �Hybrid Planning with Temporally Extended Goals for Sustainable Ocean Observing,� AAAI Conference on Artificial Intelligence, 2011, http://www.aaai.org/ocs/index.php/AAAI/AAAI11/paper/view/3667. 17. J. Quinn, et al., �Modeling and Monitoring Crop Disease in Developing Countries,� AAAI Conference on Artificial Intelligence, 2011, http://www.aaai.org/ocs/index.php/AAAI/AAAI11/paper/view/3777. 18. T. Voice, et al., �Decentralised Control of Micro-Storage in the Smart Grid,� AAAI Conference on Artificial Intelligence, 2011, http://www.aaai.org/ocs/index.php/AAAI/AAAI11/paper/view/3632. 19. P. Reddy and M. M. Veloso, �Learned Behaviors of Multiple Autonomous Agents in Smart Grid Markets,� AAAI Conference on Artificial Intelligence, 2011, http://www.aaai.org/ocs/index.php/AAAI/AAAI11/paper/view/3773. 21. N. Sundaravaradan, et al., �Discovering Life Cycle Assessment Trees from Impact Factor Databases,� AAAI Conference on Artificial Intelligence, 2011, http://www.aaai.org/ocs/index.php/AAAI/AAAI11/paper/view/3751.